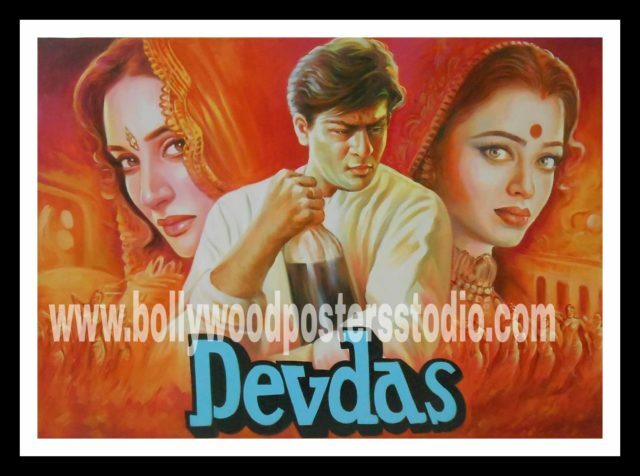 Are you looking for the authentic and genuine Bollywood poster of Devdas ? Contact us on mobile no. +919022034923 or +917666866256 or MAIL US ON : bollywoodpostersstudio@gmail.com .Bollywood posters studio offers the huge collection of hand painted Bollywood posters with the last of the Bollywood posters artists, who hand painted many of the Bollywood posters. These memorabilia hand painted Bollywood posters are vibrant and eye-catching. Bollywood posters studio provides finesse quality of work to their clients. Our billboard poster and painter artist Mumbai,India made the flawless hand painted Bollywood poster of Madhuri Dixit Nene, Aishwarya Rai Bachchan and Shahrukh Khan of the hit movie of Devdas (2002) in standard size single sheet poster on oil canvas.Bollywood poster artist have left an indelible mark on our minds. Hand painted art were not only used as means of advertising but also representing our Indian culture. Their colour captured the shades of characters and reflected the intensity and drama in high voltage on canvas.With these meaningful hand painted poster we come to know who is playing what character. Hand painted Bollywood poster on canvas by the best hand painting Bollywood poster artist Mumbai, India. Bollywood posters studio presenting the old Bollywood movie posters collection of 50’s, 60’s, 70’s, 80’s, 90’s these poster are 100% originally hand painted on canvas. Hand painted Bollywood poster art is in vogue once again. Get your impressive wall art collection of old Indian Bollywood movie posters memorabilia for sale. You can even innovate or customized your Bollywood poster alongside favourite superstar and with your family. Customized Bollywood poster for sale.